It’s an understandable sentiment. In these difficult and quarrelsome times, it’s not surprising that a lot of people are tempted to throw up their hands in disgust at all politicians and political parties and mutter “a pox on all their houses.” In some instances, such a sentiment might even be warranted. 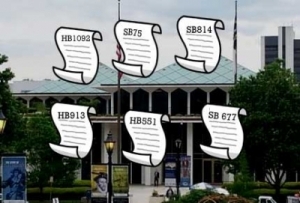 But right now, in the case of the debate over six constitutional amendments that will appear on the November ballot in North Carolina, it’s simply flat out wrong to blame all parties equally. Unfortunately, however, that’s what a clunky and poorly researched editorial does this morning in the Hickory Daily Record. Say what? How are the Democrats supposed to play any role in this when Republican legislative leaders won’t allow it to take place? Badly outnumbered Democrats at the General Assembly have been accorded literally zero role in the process. The only fighting they’ve done is for an opportunity to be heard — something that they’re often unsuccessful in obtaining. And while it’s true that two of the three Constitutional Amendments Publication Commission members are Democrats, that commission hasn’t taken any action that could be characterized as anything other than open and transparent. The editorial even acknowledges this. So what gives with the editorial’s “pox on all their houses” conclusion? Blaming Democrats for the current mess surrounding the six constitutional amendments makes about as much sense as blaming Robert Mueller for Donald Trump’s serial dishonesty. “Legislative leaders have made clear their intention to keep the voters in the dark about the true impact of the proposed constitutional amendments that will appear on this November’s ballot. Free and fair elections depend on voters knowing exactly what they are being asked to decide. The vague and deceptive ballot language mandated by this legislature undercuts the work of a bipartisan commission whose duty it is to assist voters in understanding proposed amendments. Let’s hope all North Carolinians are soon alerted to these hard truths — especially members of the news media who ought to be helping to spread the word.